Garlic adds a great flavour to many of the dishes all around the world! I would like to introduce some of the Ukrainian recipes with garlic: Carrot salad, Beetroot salad, Fried aubergine, Garlic soup, Roast with garlic & smoked plums, Egg & cheese spread… There are many ways how to consume garlic. But if you are looking more than for the taste try this, a first aid against flu, a “health kick”. 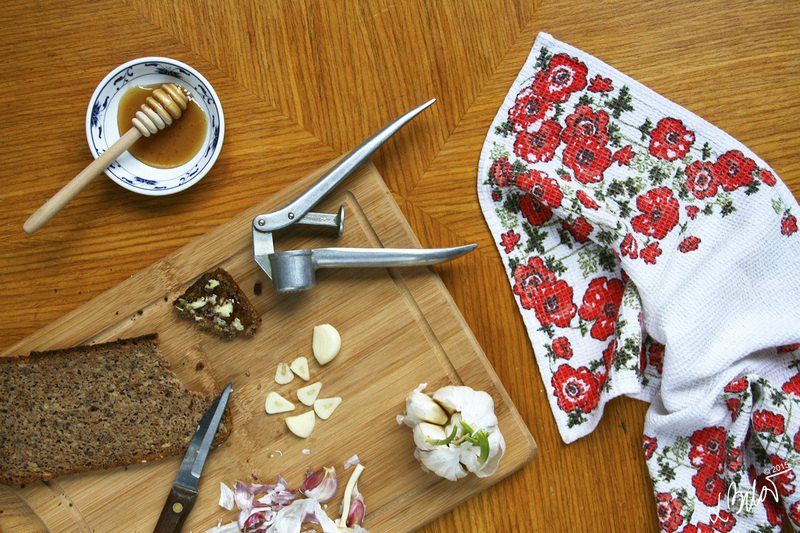 Piece of bread + tea-spoon of honey + 1 clove of garlic. Crush, squeeze or mince garlic into a fine puree. Spread the honey on the bread and add garlic on top. Bite carefully, a very small bites and chew it thoroughly. Do not drink immediately after that, have some honey instead. Also eating a raw garlic with any main meal, has a great effects. The hard neck of garlic is in the middle of head of garlic, after the cloves have been cracked off. The cloves are clustered around this main stem. It’s not always thick and hard enough, but if you lucky you can try this old school remedy for cold – blocked/runny nose. Simply light dry hard neck so its smoking, let it smoulder – not on fire. Once its smoking simply snuff it in with each nostrils. Be careful don’t burn your self. It will clear your nose for a while. Anti-Cancer Properties – The anti-cancer properties of garlic may lower your risks for various types of cancer, including gastrointestinal, colon, stomach, esophagus, breast and pancreas. Cardiovascular Benefits – The study from University of Maryland Medical Center explains – “Garlic has a thinning effect on blood, which can help prevent heart attacks, high blood pressure, atherosclerosis and strokes”. Let’s not forget about its magic power against vampires! This myth started long time ago in Egypt and Slavic regions – it was known and used not only as remedy for medical purposes but also as a powerful weapon against Nosferatu and all evil! What can I say I love vampire movies, although I have to say these days authors choose to have their vampire characters unaffected by garlic – but we all know it’s just a Hollywood trick, right? :) If you are really interested in the topic have a look here: Why Do Vampires Hate Garlic? or here 9 Reasons Why Vampires Fear It!. Have fun! Recently I discovered some info about the Garlic Pills. That’s right, Garlic Pills! The whole idea of any vitamins, available in accessible food, being squeezed and chemically modified into a pill, sounds ridiculous to me! But if you are interested read more here – Can Children Take Garlic Pills? Question: Is garlic a vegetable, a spice or a herb? Answer: Garlic looks like a bulb and is a member of the lily family. Since it is similar to onions, shallots and chives, Garlic is also considered a vegetable because it has leaves. Question: Is it ok to use sprouted garlic? Answer: Yes it is. It is a similar to the young green onion. Great for pesto. Enjoy. Its close relatives include the onion, shallot, leek, chive and rakkyo (wild onion). With a history of human use of over 7,000 years, garlic is native to central Asia as a frequent seasoning also in Africa and Europe. It was known to Ancient Egyptians, and has been used for both culinary and medicinal purposes. Garlic is known for his antibiotic effects on human body and also for incredible unique kick of taste it adds to any meal. The actual component responsible for it is Allistatin. Allistatin is an antibiotic that is found naturally in plants that belong to the Allium group, which includes garlic and onions. It is recognized as being a strong broad-spectrum fungicide and an antibiotic against a number of serious microorganisms (such as bacteria). Studies have established that the most active factors in garlic are sulphur – containing compounds which are effective agents against staphylococcus and E. coli, which are bacteria that can cause serious infections that can lead to death. For this reason, the garlic is used routinely and extensively to treat numerous infections and diseases such as whooping-cough, flu… The strongest antibacterial, antifungal, antiviral and immune-enhancing compounds can be found in garlic, including vitamins and minerals. Garlic may also start problems with digestion! Sensitive people may suffer unpleasant abdominal pain, bloating and diarrhea. Should be avoided among patients with acute diseases, digestive, urinary diseases and female genital mutilation. Garlic is not recommended for pregnant women as it reduces blood pressure.